Raws for Paws has recalled certain chubs of its Ground Turkey Pet Food because of the potential for salmonella contamination. What was recalled: 1 lb. and 5 lb. chubs of Raws for Paws Ground Turkey Pet Food with a manufacture date of Oct. 12, 2017 (Turkey Pet Food cases) or manufacture dates between Oct. 12, 2017 and Feb. 2, 2018 (found in Combo Pack variety cases). 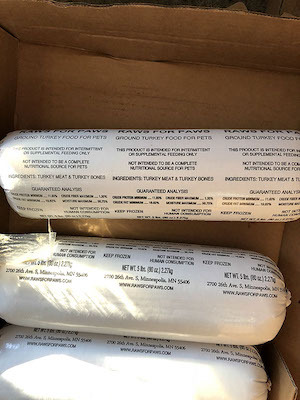 Please note that the recall involves a company called Raws for Paws out of Minneapolis — not to be confused with a similarly named company, Raw Paws Pet Food (of Indianapolis), which is not affected.